Oxblood is my first encounter with the extremely popular ink brand, Diamine. As usual, I had read and heard a lot of good things about their products, so I was eager to give them a try. 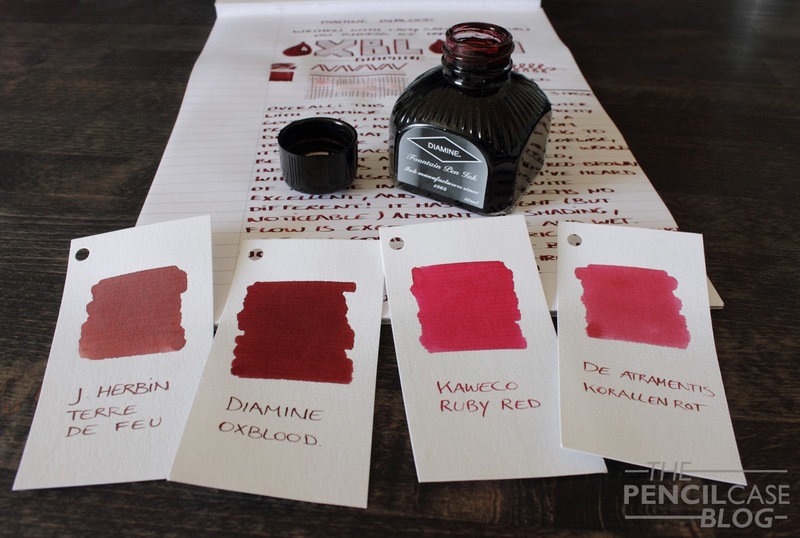 I have been looking for a good red ink for quite a while now, and hadn't found anything that really struck me as perfect yet. Diamine oxblood however, not only sounds quite cool, it also looked cool in the reviews I found online. So when I was in Tilburg a couple weeks ago, I visited La Couronne Du Comte, and got myself a couple of bottles, including Oxblood of course! 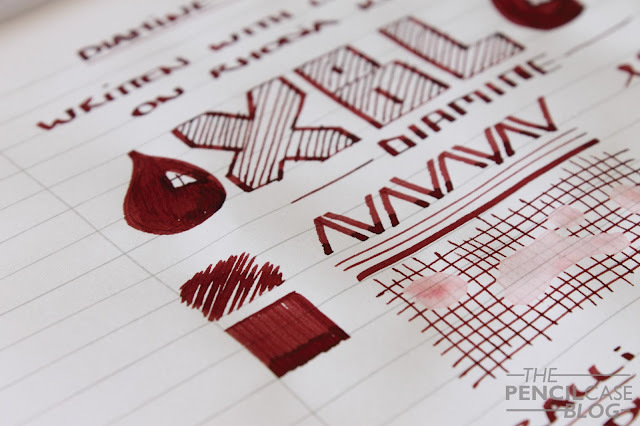 Oxblood, is a dark red-brown ink. It looks like dried blood, hence the name, but most importantly, it's a nice subtle red ink. You see, I like red, but red ink often doesn't impress me because they usually are too bright and 'in your face'. Oxblood does the complete opposite, to a point where it actually gets quite difficult to tell if it's even red (the brown undertone actually gets quite obvious under certain lighting conditions)! I like that. It's something different from a normal black or blue, but it doesn't draw too much attention. On the page, oxblood gives a nice amount of color variation, and some shading is present. 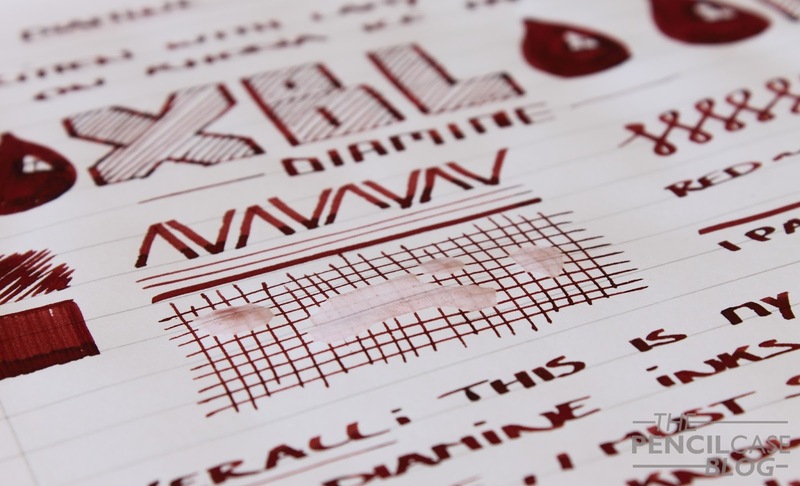 Diamine is known for producing well-behaved inks, and this definitely lives up to that. It has excellent, sligthtly wet, flow. It feels slightly lubricated, but not too much. Other than that, it doesn't bleed or feather, even on cheaper paper it behaves quite well. I think I found my perfect red! It's exactly what I thought it would be, and it's great fun to use. Oxblood isn't your typical red, and some people might find it too dark. But for me it just pushes the right buttons! At 8 EUR/ 15 USD for an 80ml bottle, it's actually quite affordable too! Note: La Couronne Du Comte Supports this blog. I received a discount on this purchase, so I could write this review. I was in no way influenced in the making of this review, the opinions shared here are completely my own!